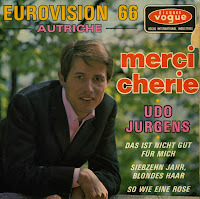 Udo Jürgens and Thomas Hörbiger composed the song 'Merci, Chérie', with which Jürgens represented Austria in the 1966 Eurovision Song Contest. Despite the French title, the song is performed in German. It is an earnest ballad, in which the singer thanks his lover (hence the title, 'Thank you darling') for good times and positive memories. Jürgens won the Contest with this song, and scored a hit in several European countries as well. To date, he is still the only artist to bring victory in Eurovision to Austria.